The afghan you made is so pretty!!! I love the little red balls on it. I love that song and the clever wording of a thought. Can't wait to see him this summer! Love Tim McGraw's and his backside....oh my! Blanket is beautiful....I used to knit maybe start that up again! Have a wonderful Wednesday! I didn't think of Biscuit! My granddaughters love that book! Sure wish the NHL would announce the conference semi-finals schedules! I know, I know ... they're waiting for the quarter-finals to end, but I am antsy for some Blues hockey! I'd LOVE to get some tickets for this series (if there are any available), but with no schedule announced, I'm reluctant to try to buy some tickets since we'll be going out of town ... I don't want to buy tickets for game 1 or game 2 (in St. Louis) only to find out that we'll be out of town that night. Go Blues! Go Flyers! Great answers! 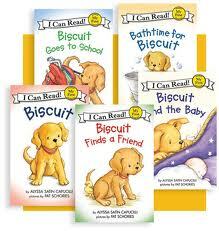 I remember Biscuit!! I, too, would be most likely to read a book or organize something! the blank #3 says it all. Your lie is that you don't tell lies. Maybe "lie" is too strong of a word.